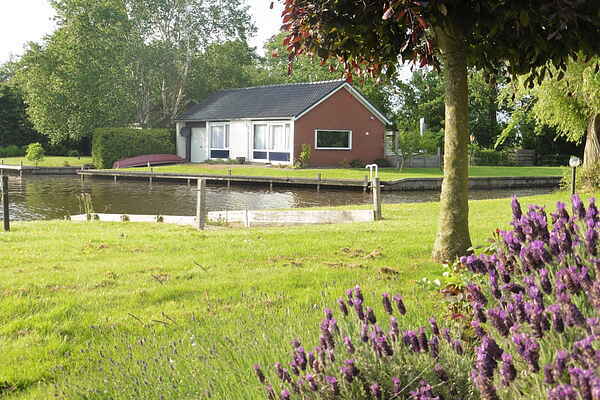 Stay at this unique bungalow right on the Langweerderwielen lake near Joure and Sneek! You can sail directly onto the Frisian Lakes from your holiday home, after which you can follow numerous sailing routes to charming watersports locations. Langweer has a central location and is the ideal base for all watersport enthusiasts! The detached bungalow has an enormous garden of a whopping 700 m2! You can linger until late into the night on the lovely terrace, while the children can amuse themselves in the rowing boat in front of the house. There are also two bicycles available for you! The bungalow is small, but nice and equipped with all amenities. From your holiday address you can take many nice day trips. Visit the Chameleon village in Terherne, cycle along the authentic Frisian villages or plop yourself down on one of many outdoor cafes! Bad weather? Then visit Swimfun in Joure! The subtropical swimming paradise of the northern Netherlands!